The sauna warms the body in the same manner as natural sunlight, at lower temperatures than traditional saunas. The wood in our sauna is Birch and Poplar, it does not release any fumes or odors. The joints are dove-tail, so no toxic glue chemicals are present. 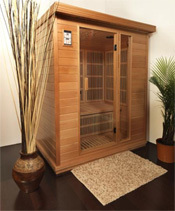 Infrared saunas heat you from the body core outward. They have a deeper tissue cleansing effect, penetrating the skin one to one and one half inches with gentle warmth.